I put this in the Tool Talk section because I consider this a tool used to help me collect rocks. Of course thats just my excuse to have a new toy, but I'm sticking with my story! I've had my eye on one for years. Finally managed to save up the money and make the right deal this summer. So here is my new rock-getter. It is going to allow me the ability to collect in a lot of areas I couldn't get to in the past. Theres a lot of places that a truck just can't go, and most of these places are too far to collect on foot. This weekend was the first run. I went to an area I have been to many times and was amazed how many spots I was able to go that I've never been before even though I stayed in about a 10 mile radius of my camp. I'm looking forward to exploring many places that I've always wanted to check out. And heck, its just plain old fun to go for a ride! This is an example of a place a truck wouldn't go. 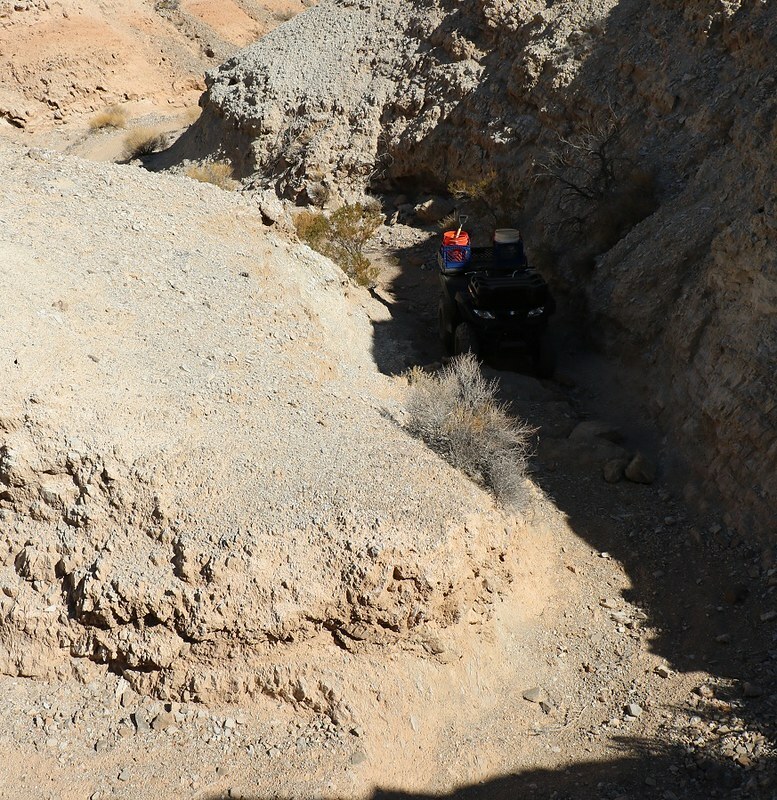 This canyon got narrow enough that even a Jeep or a side-by-side would've been leaving some paint on the walls, if they could get through at all. I rubbed the wall a couple times even on the quad and put the first scratches on her. But it led up to a small valley I've been wanting to check out for years and I was thrilled to finally have access there without having to hike the several miles in. I've had the same thought for a few years myself... I just haven't been able to scrounge up the cash. I would love to hear more about your quad adventures. What works, what doesn't, what you like about your ride, and what missed your expectations. I'm probably still a couple years out (i.e. kid in college) but a guy can dream, right? Congrats on your acquisition, I wish you many happy miles of motorized rockhounding adventure! Awesome! Congrats on the new toy. You'll definitely be required to post pictures of all the places you go that you couldn't access before. I have been lucky in my old age as I have been able to train Gergis and just drive him out and say fetch. His hound and I sit in comfort while the youngster gets the adventure. 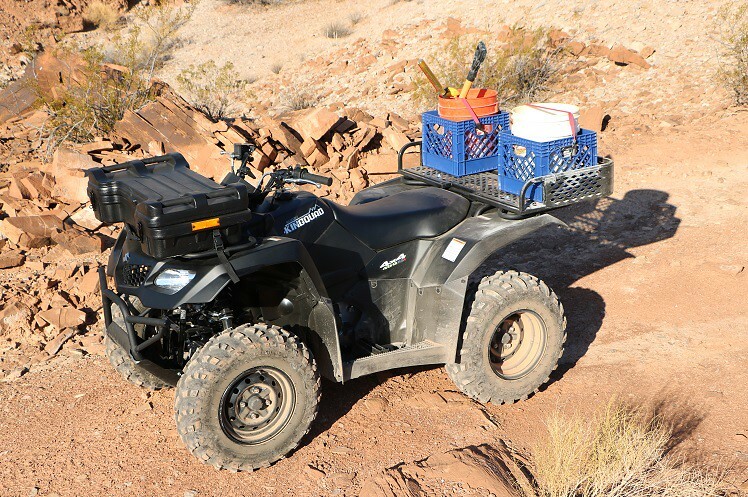 Your set up looks very good but do you have a bit of emergency water and gear if something goes wrong with the quad when you are to hell and beyond.The inability to walk out 15 miles in case of an emergency has tremendously curtailed my knarly truck adventures in the mountains. I'll be sure to share some pictures of my future adventures. And I'll let you know what works and what doesn't and share any tips I find along the way for rockhounds who intend to do something similar in the future. The milk crates on my rack are bolted down solid and I just drop the 5 gallon buckets in there. The buckets stay in place pretty well but I throw a bungee over the top just to secure them. Things can easily bounce out though, especially the longer tools sticking out the top. I'll continue to revise the system as I go along. Still need to add holders for longer tools (shovels, picks, bars, etc) also. As for emergency preparation, well I'm an Eagle Scout and I have always lived by the scout motto..."Be Prepared". I have been shopping pretty intently for a quad for about a year. I looked at a lot of used machines over that time but in the end I decided to buy new just for the simple peace of mind that I knew exactly how the machine had been treated and taken care of for its entire lifespan. Reliability is one of the biggest factors to me as I will often be in remote areas and I will almost always be alone. And before I ever even took the machine out on its first run I had already set myself up with a good tire repair kit and foot operated air pump, a micro jump-starter, a spare spark plug and a tool kit. Eventually I will add a winch and a manual pull start mechanism (in the event of a failed starter even the micro jumper wont help). And I will carry a full spare tire for long runs or in areas where I will be rough on tires (you tear out a sidewall and no repair kit will help). I intend to be able to always get the machine back to camp. In the event I can't get the machine back to camp I never go anywhere without supplies. I reckon the farthest I would ever find myself from camp is maybe 20 miles, and thats probably extreme because I get deep in to remote areas to set my camp in the first place. Most often I figure I'll be 5 to 10 miles from camp. When I'm out on the quad I wear a day pack with lots of water and some easy food like trail mix and jerky. Water is the key though. I try to anticipate how far away I plan to ride and carry enough water to easily make the hike back if I have to. I carry a minimum of a gallon whenever I leave camp. I also have a custom designed emergency survival kit that I designed years ago when I used to hike and backpack a lot. I keep that along as well (but in all honesty it is best suited to finding yourself dropped in the mountains with no supplies at all). As long as I get back to camp I'm golden because I am always set up at my camp to survive for an extended period if need be and the wife knows where to send rescue to start searching if I don't come home. I would never abandon my camp and try to hike out if, say, my truck broke down and I was a long way from a road or cell service. I'd settle in, enjoy the extended camping trip, and wait for the cavalry. But now that I have the quad I could actually ride out to get help on the quad. Whats the chance I break both the truck and quad at the same time? And the road out from camp to get help would be smooth going on a quad. All that said, theres always the unknown or unseen factors. All you can do is prepare yourself and have a set of survival skills to fall back on in any emergency. I've spent my whole life enjoying solo outdoor adventures and until my body won't let me anymore I will continue to do so. But I'll admit, I wish I had a Gergis of my own sometimes! Sounds well thought out.Last September lots of people went hiking one weekend without looking at the forecast.I suppose fall colors make folks do stupid stuff. Many were hit by 4 feet of snow and very few did not need to be rescued,Please tell us about your adventures which to me are more important than any rough I may find. The image of the rough in your mind is ephemeral but adventure sticks with you and changes you. Congrats on the new wheels! Great rock-getters. How about one of those GPS emergency beacons? In an emergency it sends a signal to a GPS satellite and back to Earth for help. If I was on a solo trip in the vast desert I would definitely have one of these small devices. I think they still run for only a couple hundred bucks. Years ago my wife learned of these devices ("Spot" makes a good one). She tried to talk me into it back then, and since then they've only gotten better. They originally only provided emergency service to call for help, but now they allow two way communication via satellite as well. But they are not cheap and there is a subscription fee to use them. I suppose if I were doing some real extreme things (solo ocean crossing or arctic exploration) I could justify it, but if I die 25 miles from a highway in the Mojave desert, well, so be it. Besides, part of what I really enjoy about what I do is the the isolation and the thought that I am on my own out there. It adds a sense of adventure to my explorations, and forces me to remain vigilant and stay prepared. I'm afraid I would find myself slacking off if I knew I had an emergency communication device to fall back on. I have a spot connect. It can send out short text messages with the use of a smart phone. If you hit the 911 button it will send emergency help, search and rescue. Ect. PS: I just spent 4 days picking rock in the Owyhee's. Simple places like my claim and also Queenstone. It was really quiet as the shooting has not started yet. Although you can watch the trucks go by at Queenstone location. Only did that for a half day and then back to the remote hills. Nice. One thing I miss about not living in CA anymore is the silence of the Mojave Desert. I see the point of the all terrain vehicle with respect to width of the wheel base for small spots. My wife and I have been thinking about this for a while and thought it might be good to have one of the dune buggy type vehicles that has a really high clearance, but it would be considerably wider than what you have here.